If you are recovering from Prostate surgery, experience frequent urination or other urological problems associated with male incontinence, Afex™ offers an innovative solution to keep you active and worry free! The Afex™ Receptacles is an essential part of the Afex™ Incontinence Management System. 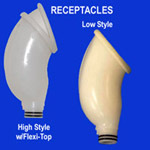 It eliminates the need for adhesives and external condom catheters by offering a new, more comfortable way to wear incontinence protection. 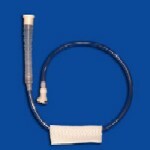 The double-wall design with drain holes elevates the skin, keeping it away from urine residue and backflow.